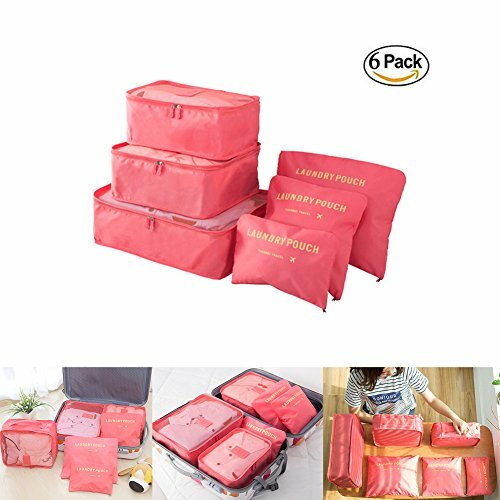 【3 X Packing Cubes, 3 X Laundry Pouch】 can meet the requirements of 7-10 days travel goods. SIZE: [3 packing cubes] : large: 15\"x12\", medium: 12\"x11\", small: 8\"x11\" [3 packing pouch] : large:13\"x10\", medium: 10\"x10\", small: 10\"x6\". 【Convenience】It\'s very convenient and much easier to pack anything from clothes to souvenirs. The mesh design for easy identification of contents and ventilation. Separate your clean and dirty clothes, wet towels, prevent bacterial growth, smell reduction, protecting clothes and luggage from wrinkles, dirty and damage. Breathable mesh cloth to keep clothes clean at all times. This also makes security checks at the airport quick and convenient. 【Save Space】Fit 20 inch suitcase. It easy for you to save space in your luggage/bag, to maximize the volume and help you classifying your belongings and keeping them from getting lost. 【Function】 Ideal for outdoor activities, including traveling, picnic, camping, gym, beach, or yoga. Goods can be classified into different packages, such as: large bag for shirt coat. Small for Bra ect. Middle for Toiletries and cosmetics, or you also can put them as your like.